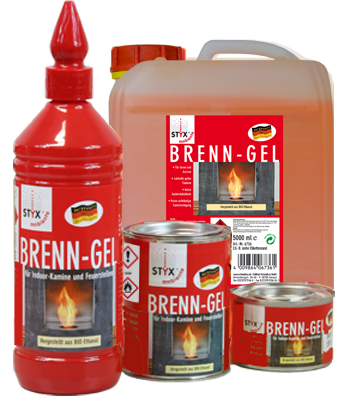 STYX burner gel is the fuel specially developed for use in decorative fireplaces, torches and patio burners. STYX burner gel creates a glowing atmosphere with safe and simple lighting! Due to the special formulation, it is readily suitable for indoor and outdoor use alike. STYX burner gel is available in a 1,000 ml bottle, a 5,000 ml cannister, as well as the practical 220 g and 500 ml cans.